Virtual truckers can now start to warm up their engines with the release of the mobile game Truck Simulation 19 for iPhone®, iPad® and smartphones and tablets using the Android. Original trucks, a huge open world map and more unique futures create an authentic, pocket-sized world of trucking. The US truck brand Kenworth is represented in Truck Simulation 19 by three detailed iconic models. The realistic appearances and the true-to-original cockpits of the aerodynamic on-highway truck T680, the powerful workhorse T880 and the iconic W900 will make every truck fan’s heart beat faster. Additionally, the driver cabs of the Kenworth trucks can be adapted depending on the distance that needs to be covered. Three powerful models of the famous truck manufacturer MACK are also on board of the mobile trucking adventure. Owners of the high-performance Mack Anthem, the strong Pinnacle Axle Back and the elegant TITAN BY MACK are not only able to change the basic equipment of their truck. They can also customise their vehicle to their heart’s content within a complex customisation system until their MACK truck meets all their visual requirements. 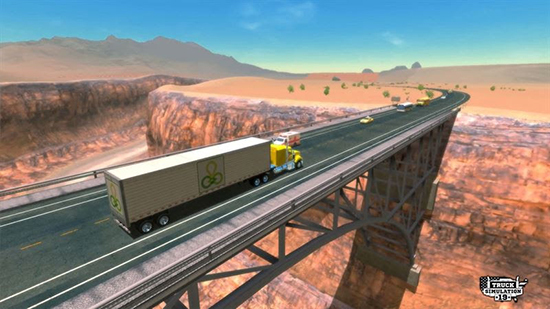 Truck Simulation 19 is now available for iPhone and iPad in the Apple App Store for 3.99 Euro/2.99 USD/2.99 GBP (RRP). The game for smartphones and tablets using the Android operating system is available for free on Google Play in a version of limited content. The full version can be unlocked at a price of €3.99 $2.99 £2.99 (RRP).